Well hello there. The plan this past sunday was to do a very special "Extreme Sundae Sunday" starring one of Friendly's SundaeXtreme flavors.... that was until I got the evil super bug from wherever that has inspired a week long cough. Grrrrrrr. The worst part is my daughter then got sicker than I did with the same menace. So Sundae Sunday was cancelled, but the ice cream lived on and was easily devoured. 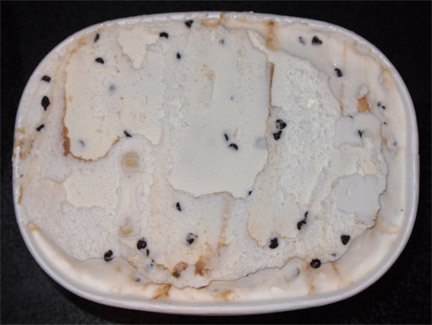 Let's take a look at what would have been - Friendly's SundaeXtreme Chocolate Chip Cookie Dough which is billed as Vanilla Flavored Frozen Dairy Dessert with Cookie Dough Pieces, Semi-sweet chocolate chips and Cookie Dough Swirl. They had me with the cookie dough part so let's dig in. Well that's one funky opening shot for a cookie dough. I think I'm excited. Nice! I slice off the top and it looks even better. I'm definitely excited now. There's lots of random swirl, tons of cookie dough chunks, chips everywhere... wait, HAHAHAHA, there's no chips in my cookie dough! Look close and you'll see that Friendly's has split them apart. Part of me wants to complain but the other part says what a unique way to boost overall chip count. Weird, I almost think I taste peanut butter with that first bite, maybe because I got two or three cookie dough bites in there. Inspired, I continue on.... but several bites in and I keep missing the cookie dough, hmmm, they seem to be clumped together since I just got two again. To be honest, I'm not loving the tiny chocolate chips. They are very itty bitty. I do appreciate them being different, but I think some mystique is lost by them not being in the dough. They just don't balance each other out the same way. Wow, that was quick. I didn't scoop myself much and let it sit longer than i usually do, so I plowed right through it. Guess we'll just have to wait for the in depth second scooping. On Second Scoop: Yeah, the second and third scoopings were just as quick. It's a soft ice cream that puts up little resistance going into your belly. It's a decent ice cream, but I don't love it. It feels incomplete despite being chock full of goo and chips. It's close, but it's just not there. It looks incredible. Too bad it didn't taste that way. indeed it does, and it is decent, it's just not epic. So sorry to hear you and your daughter have been sick. The ice cream looks good but seems to have a lot going on. Wishing both you and your daughter improved health soon! thank you, we are shaking the bug slowly. And yeah, it's very busy... busy but not quite there. Dubs sorry to hear this one wasn't a winner (still can't find this one in my local stores). 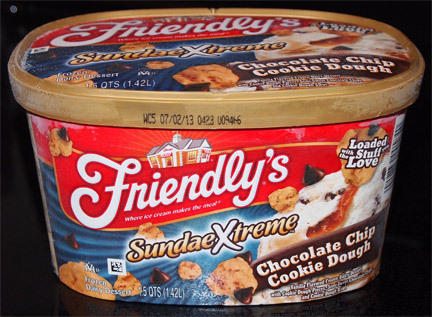 I loathe FDD but the one Friendly's Xtreme I like is the Mint Cookies and Cream. You're WAY OFF with this review. I woldn't even call it a real review. 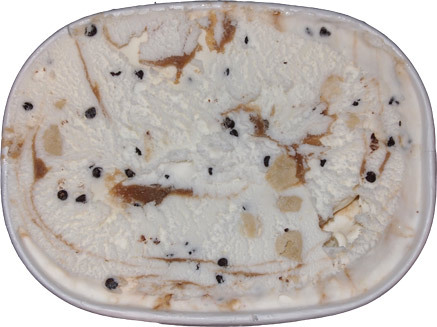 Every scoop has Chocolate Chips and Cookie Dough. The ice cream is a smooth vanilla that isn't overpowering, and it's not as sweet as you'd expect. Who doesn't like mini chocolate chips? You? Well I love them! I'm curious to know what cookie dough you think is better than this and why? 1) not a real review? at least I can tell the difference between frozen dairy dessert and ice cream. 2) I never said it was terrible, did I? No, I just said it could be better. 3) We're all different, the secret in life is embracing the differences. Commenting like you just makes you come off like a jerk. Enjoy your "ice cream", I'd rather buy another sweet pint of Blue Bunny's version or maybe go super premium with something like B&J's Milk & Cookies. Now, now, no need for name calling. I'm not a jerk, nor did I come off like one. I've tried blue bunny and I find the vanilla to be way too sweet and overpowers the chocolate. Ben and Jerry's used to be tops when it came to cookie dough, but good luck in finding any actual cookie dough in there. Milk and Cookies by B&J isn't cookie dough, and I'm not a fan. Half Baked (the original version) is much better in all respects. You should take your own advice and learn to "embrace the diferences" instead of attacking people like me who disagree with you. Fine, jerk may have been a little strong, but your second comment was much more relatable than the first. If you had said that the first time, I would be fine with it, but let's admit you did kind of attack me, or at least my "review". How about Turkey Hill? Or one of the premium brands in the city? Why does the chocolate chip ice cream taste different lately? It's way to milky creamy, it looks way to white and the chocolate chips are so big all of a sudden and they taste gross. What's up with that? Does anyone else notice this? Are you talking about this flavor or another? Either way, Friendly's has spent the less several years lowering the quality of their ice cream to the point where I avoid it for the most part. I'd blame it on Dean's but they were headed downhill before the sale.